We are more than used to seeing Christianity as a religion characterised by love: love of God and love of neighbour, which is quite right. It can be all too easy for this to be transformed into a religion of niceness, but at no point in the Sermon on the Mount does our Blessed Lord say ‘Blessed are the nice, for they will have a nice warm fuzzy feeling deep inside’. We are not called to like people but to love them. It is costly and difficult, and the religion of nice offers us syrupy sentiment in place of costly love. It plays down the cost and difficulty of living a Christian life, and offers us something superficial and worthless. It is difficult when we read passages like this morning’s gospel. Our Lord comes not to give peace but division. Given the massive strides made in the last fifty years towards Christian unity and healing the wounds of our past and divisions, this can sound shocking or even wrong. And yet what Christ comes to bring will cause division because it forces people to make a choice – do we wish to follow the ways of the world or the Gospel? These two can never be reconciled – only in the City of God can we see the rule of love. Only by choosing Christ over the world can His love rule in our hearts and our lives. It is a difficult and a costly choice – we will face ridicule, we will be considered fools, who have chosen a hard and difficult path over the easy path of the ways of the world. People have always rejected Christianity, ignored it, or treated it with contempt, because it is difficult and costly, it asks a lot of us, and what it offers can be easily mocked – when we proclaim it by our words and actions we have to expect to be treated like Jeremiah and thrown down a well, what we stand for is dangerous and awkward, a truth which the world does not wish to hear. It isn’t as though living the Christian life is easy – we will fail often, we will be like Jeremiah sinking in the mud – but the love and grace of God can lift us up, this can heal and restore us, and help us to continue our pilgrimage through this life and the next. 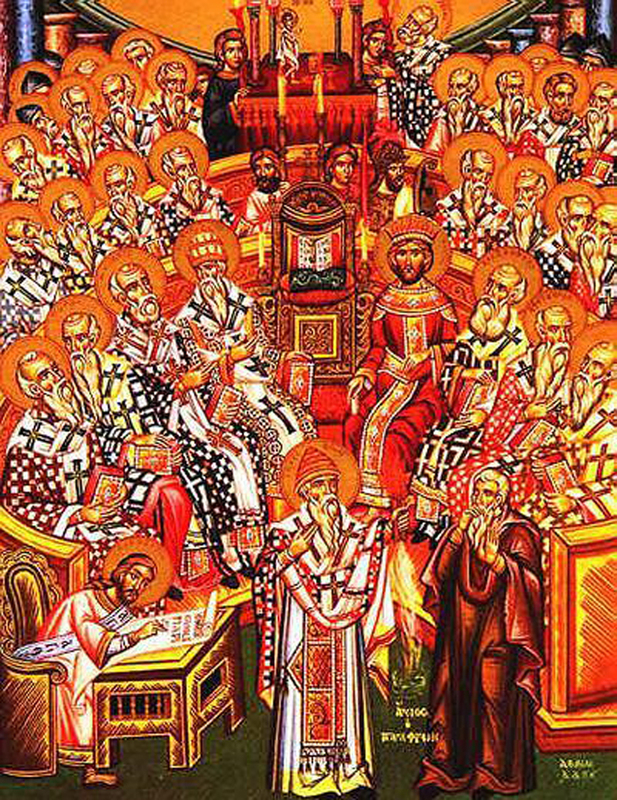 We are, as this morning’s epistle puts it, surrounded by ‘so great a cloud of witnesses’ martyrs, those who have borne witness to the faith, the saints whose life and prayers can strengthen and inspire us – they show us the path we should tread. We have to look to Jesus and to His Cross to see God’s love for us. What is shameful in the eyes of the world, we can see as glorious – true love which gives regardless of the cost, which forgives sins, which heals and restores broken sinful humanity, which gives us the hope of heaven. This is grace the free gift of God, giving Himself who shared our humanity so that we might share His divinity, strengthened by Word and Sacrament to live out our faith. 4 Διαμαρτύρομαι ἐνώπιον τοῦ θεοῦ καὶ Χριστοῦ Ἰησοῦ, τοῦ μέλλοντος κρίνειν ζῶντας καὶ νεκρούς, καὶ τὴν ἐπιφάνειαν αὐτοῦ καὶ τὴν βασιλείαν αὐτοῦ· 2 κήρυξον τὸν λόγον, ἐπίστηθι εὐκαίρως ἀκαίρως, ἔλεγξον, ἐπιτίμησον, παρακάλεσον, ἐν πάσῃ μακροθυμίᾳ καὶ διδαχῇ. 3 ἔσται γὰρ καιρὸς ὅτε τῆς ὑγιαινούσης διδασκαλίας οὐκ ἀνέξονται, ἀλλὰ κατὰ τὰς ἰδίας ἐπιθυμίας ἑαυτοῖς ἐπισωρεύσουσιν διδασκάλους κνηθόμενοι τὴν ἀκοήν, 4 καὶ ἀπὸ μὲν τῆς ἀληθείας τὴν ἀκοὴν ἀποστρέψουσιν, ἐπὶ δὲ τοὺς μύθους ἐκτραπήσονται. 5 σὺ δὲ νῆφε ἐν πᾶσιν, κακοπάθησον, ἔργον ποίησον εὐαγγελιστοῦ, τὴν διακονίαν σου πληροφόρησον. 4 I charge you in the presence of God and of Christ Jesus, who is to judge the living and the dead, and by his appearing and his kingdom: 2 preach the word; be ready in season and out of season; reprove, rebuke, and exhort, with complete patience and teaching. 3 For the time is coming when people will not endure sound teaching, but having itching ears they will accumulate for themselves teachers to suit their own passions, 4 and will turn away from listening to the truth and wander off into myths. 5 As for you, always be sober-minded, endure suffering, do the work of an evangelist, fulfil your ministry. “Why are you so afraid? Have you still no faith?” Our Lord asks this question to the disciples and he asks it to us – to challenge us to live out our faith amidst the storms of this life. This year the Third Sunday after Trinity also falls on the Feast of the Translation of St Richard of Chichester, Bishop and champion of the church against the state. I like many people came to know him through the words of his prayer, most of which was recited by him upon his deathbed: Thanks be to thee my Lord Jesus Christ for all the benefits Thou hast given me, For all the pains and insults Thou hast borne for me. Richard had a difficult and eventful life, trying to reform the life and practices of the clergy, and defending the church from interference by the state – some things it would seem in this country never change! In the face of a secular power who wished to tell the Church what to do, Richard said No. He was a man of great learning and sanctity, a great friend to the poor who lived out his charity in his life, but above all else he was a man of principle who resisted the encroachment of secular power into matters which belong to the Church. Oh that we had his like amongst our bishops nowadays! Someone to tell the lower House of Parliament to mind its own business and not meddle in matters which do not concern it, that the Church cannot be bullied into accepting the will of such a godless brood of vipers: corrupt, amoral, and enslaved to a godless ideology – seeking to conform the Church to the world and to make up a perversion of the Gospel after their own tastes. And may God have mercy on their souls. The only way to resist is by being both polite and firm, but most of all by practising that charity which lies at the heart of the Gospel of Our Lord and Saviour Jesus Christ – in our care for the poor and the downtrodden, in our living out of our faith. If we follow the example of St Richard, and refuse to compromise the Gospel and live out our faith we can truly said to be following Christ, who came to call the world to repentance, to turn away from selfishness and sin. We cannot let the light of our faith be hidden under a bushel, it has to shine as a light to the world, dispelling the darkness of sin and sloth, or that polite indifference so inimical to the zeal of the gospel. Only through this can the Church grow to be like the mustard tree so that all may be safe in its embrace, freed from sin, and rejoicing in the new life of Christ. It’s not easy, but that’s the point, when was anything worthwhile easy to achieve? Let us remember that we have that greatest of treasures, the pearl of great price which is faith in Christ, so let us share it, unafraid of the storms of this world since we trust in Him, who has overcome this world, sin and death, for our sake. Let us trust him, and love him, and each other, so that the world may believe and give glory to God the Father, God the Son, and God the Holy Ghost, to whom be ascribed as is most right and just all might, majesty, glory, dominion, and power, now, and forever.